In-car infotainment is a collection of wide features installed in the car to provide entertainment, information and communication services. It possess climate control, navigation, Wi-Fi, Bluetooth, interactive voice recognition services, live media streaming services and smart technology for mobile integration. Driven by the demand for more connected vehicles, in-car infotainment is getting more and more sophisticated. Car makers and electronics and software developers’ work together to come up with user-friendly, safe and easy to use in-car infotainment system. In-car infotainment market is expected to garner a CAGR of 9.3% over the forecast period i.e. 2017-2024. Increasing number of automobiles on road, burgeoning middle class population and inclination in the adoption of technologically advanced cars are some of the factors anticipated to impel the growth of in-car infotainment market in the next few years. Geographically, Europe is expected to dominate the global in-car infotainment market over the forecast period. In Europe, Germany and the U.K. are the leading markets for in-car infotainment. The rising demands for high-performing cars in these countries provide lucrative opportunities for the manufacturers in Europe. However, Eastern Europe and North American countries such as Mexico and Canada still have the potential market in in-car infotainment systems due to increasing capacity of vehicle production and as well as the need for better in-car infotainment system. 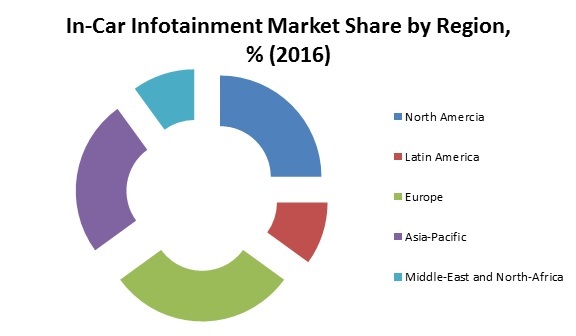 Rising disposable income coupled with increasing purchasing power of consumer is envisioned to bolster the growth of global in-car infotainment market. Further, increasing demand, production and sales of technologically advanced cars are other key drivers anticipated to intensify the growth of in-car infotainment market during the period 2017-2024. Moreover, rising urbanization and easy financing options are believed to anticipate the sales of cars all across the globe which is further likely to expand the growth of in-car infotainment market during the forecast period. The in-car infotainment market is gaining momentum with increase in demand for luxury cars integrated with various features for entertainment, climate control, navigation and others. However, higher price for in-car infotainment systems and need to upgrade the system software timely is likely to hamper the growth of in-car infotainment market in future. Moreover, the distraction caused by in-car infotainment services to the driver while driving in terms of safety norms taken by government is an another factor anticipated to hinder the growth of the in-car infotainment market.